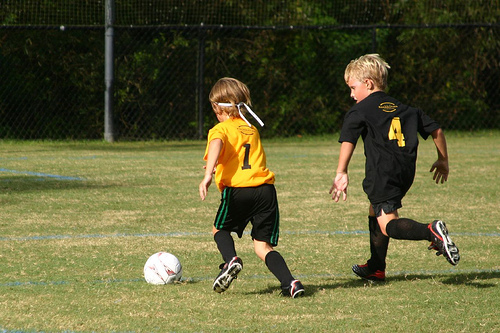 Sports Costs > How Much Do Private Soccer Lessons Cost? How Much Do Private Soccer Lessons Cost? Private soccer lessons are designed to teach a player individually. These lessons help develop that specific player’s strong points as well as identify and fix their weaknesses. Chances are that in your area there are various sports facilities that are dedicated to teaching kids about the game of soccer. This includes how the game is played, the different rules, the team aspect, and the fundamentals of the sport. Just like any sport, soccer will take time and experience to really learn and become the best you can be. On average, the typical private soccer lesson is going to last one hour. The average cost is going to be anywhere from $55 to as much as $130 per hour. The costs will really come down to your geographical location, the facility through you sign up with and the credibility of the instructor. For example, Totalsoccer.us provides private soccer training for any age kid. For a single session, it is going to cost $80. Twelve sessions would cost around $60 a session. If you want semi-private training with 2-3 individuals, it will cost $90 per session. Price indicated is for the entire group. The United Soccer Association also provides private soccer training lessons. Getting a foundation package with four sessions cost $100 per hour. An individual session will cost $110 per hour. With these lessons, you will learn more about the fundamentals of the sport. These fundamentals will include dribbling, shooting, passing the ball, control, how to win the ball in the air, turning with the ball, volleys, 1v1 defense, and how to identify and break bad habits. Depending on the instructor and the age of the player, lessons can also help you prepare for soccer tryouts. Academies will provide state-of-the-art and innovative soccer training techniques. Your child will also be provided with instructional aids and all the equipment he will need for the lesson itself. You can also take advantage of a climate controlled indoor training facility. These soccer-specific facilities duplicate the surfaces of an actual soccer field. In addition, there is a conference area where your child can participate in video analysis and progress evaluation. When it comes to safety and security, proper warm-up techniques will be taught. This will lower the chances of sustaining an injury during gameplay. One extra cost that needs to be considered is the gear. You will need to purchase soccer shoes as well as clothes that are geared for soccer play. There are soccer clothes available at most sports shops. Plan on spending at least $100 to $200 for a complete setup. Depending on the age, you may want protective equipment such as knee or elbow pads. If the instructor wants your child to practice different things at home, you may need to buy certain equipment to use for the exercises. If you want specific training goals attained by your child, private lessons are the way to go. It allows the trainer to focus on the specific demands of your kid. You should be able to see a difference in the skills and gameplay of a child after a few private lessons have been completed. If you want elite soccer training for your child, consider overseas training seminars at high-class academies in Spain, Italy, Brazil and the United States. Let your child learn from the professionals. Be sure that you choose the soccer school with professionals as their trainers. Before signing your child up for private lessons, make sure that it is something that he or she really wants to do. If the child is not passionate about it, they will start to look at soccer as a chore rather than a sport that they should enjoy. Also, make sure that your child has the potential to be a great player before you decide to spend all the money for private lessons. What kind of training could you provide? What training themes do you include in the training? Do you conduct a player profile? The more lessons you purchase up front, the more you are going to save in the long run. Ask about a bulk discount before signing up for classes. If you want a more cost-effective option, consider letting your kid join small groups. For instance, if you were to join a group of six players, the costs could drop to $15 per hour. There are also instructional videos that can be used as well as drills and exercises that can be found online.